A beautiful and elegant drawstring bag to organize your travel needs. Great for organization in your luggage and for storing delicate undergarments. Practical shoe bag or use for soiled laundry. These unique succulent bags make practical and adorable bags for gift giving. Include a gift card inside to that special nursery, a selection of hand creams, garden gloves, secateurs, jewelry – whatever inspires you. The prefect gift for succulent fanatics, plant or nature lovers, birthdays, Mother’s Day, bridesmaids, teachers, or, treat yourself! 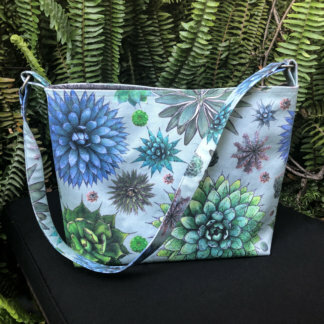 Unique succulent and botanical textiles are designed and handcrafted in California. 100% Italian cotton sateen drawstring bag. Sizes vary slightly, but most are 13-14 inches wide by 16-17 inches tall. **Please be aware that these are individually handmade, so the layout of the fabric pattern and size may vary, but all are lovely!